Robert Walter Finch came to Chelmsford from Romford to be the golf professional at Chelmsford Golf Club. He married in 1913 and had two children. He died in April 1917 from wounds received at the Battle of Monchy-le-Preux. His home was in Wood Street. On 14th April 1913 Robert married Scottish-born Jessle Wilhelmina Wilkie at Chelmsford Register Office. Soon after her birth Jessie had been registered as ‘Janet’’ rather than the Jeesie used later in her life. At the time of Robert’s marriage he was aged 27, employed as a professional golfer and lived at Glen Cottage in Galleywood. His bride was three years younger and lived at Rushencroft in Galleywood. Their home was a house on the corner of what is now Moulsham Thrift and Wood Street in Chelmsford, a site now redeveloped as flats. On 30th July 1913 their son Ian Stewart Finch was born. He was followed by a daughter, Jessie Isobel Finch, born on 18th April 1916 in the house on the corner of Moulsham Thrift. That year Robert’s younger brother Sydney George Finch was killed in action while serving as Private 19171 in the 1st Battalion of the Essex Regiment. By then Robert as serving as Lance Corporal 28742 also in the 1st Battalion of the Essex Regiment. 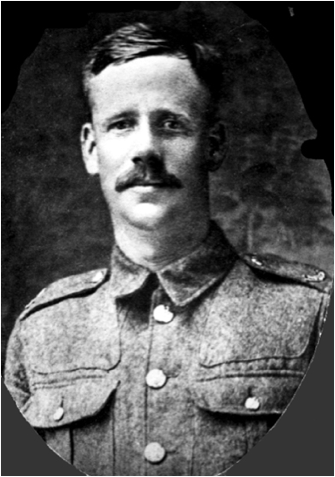 He was wounded at the Battle of Monchy-le-Preux and died from his wounds on 17th April 1917. Today he lies at Duisans British Cemetery, Etrun, Pas de Calais, France (grave: III. B. 28.). Robert is not commemorated by the Civic Centre Memorial in Chelmsford, but is recorded on Galleywood's War Memorial. Robert's widow died in 1961. Robert was born in Romford on 5th October 1884, the son of John Finch and Emily Finch (nee Fox). His father had been born in Romford in 1849; his mother in Epping in 1863. John's siblings (all Romford-born) included William Finch (born in 1875), John Finch (born in 1877), Harriet Finch (born in 1880). Emily Susanna Finch (born in 1882), May Finch (born in 1887), Sidney George Finch (born in 1890), Amy Louise Finch (born in 1892) and George Finch (born in 1895). In 1891 Robert was recorded by the census, aged 8. living with his parents and five siblings in Romford where his father was a general labourer. A decade later the family was still living in Romford, with Robert and his brother John both employed as labourers for a golf professional. There father was a labourer. By then Robert's mother is believed to have died. Robert's father died in 1908. In 1911 the census recorded 25 year-old Robert boarding with the Brazier family at Glen Cottage in Galleywood. Robert was a golf professional at Chelmsford Golf Club, a position he is thought to have held both before and after the club relocated in 1910 from Galleywood Common to its current location off Widford Road, Chelmsford.